I also know about silly things like what a French accent really sounds like or typical bank protocol in case of a robbery. So when I see a movie with a bank heist and I can spot a half dozen problems right off the bat, it drives me crazy. Though not as crazy as hearing an actor butcher an accent when the director could just cast a talented actor from the country, for heaven's sake. Ugh. I'm sure you've had a similar experience where you've watched or read something you know a lot about, just to get frustrated and stop watching when you find inconsistencies or flat-out impossibilities. It's super annoying, isn't it? And it comes from writers not writing what they know. We've all heard that advice, to write what we know. If you're like me, you've scratched your head and wondered what that means for you as a writer. By this logic, I should stick to writing about being a freckle-faced redhead from Canada. I should write about coming from a blended family or being a business woman or a wife or a mom. I should write about having oatmeal on my clothes All. The. Time. Unfortunately, I write YA, and few of the topics "I know" appeal to me as a writer (though my characters always have freckles). So how can I write what I know if I don't want to write what I know? Because that laundry list of facts isn't all I know. I also know about loss and heartache and having your whole world ripped apart and put back together in a completely foreign way. I know about mourning and longing. I know about hope and joy. I know how it feels to be rejected. I know how it feels to be truly, unconditionally loved. I know about experiencing a pain that I swear would last a lifetime (and, indeed, seemed to). I know how time and the love of my Savior can heal even the most grievous of wounds. Writing is hard, and writing what you don't know can take an almost laughable amount of research. But just because you've never worked in a restaurant, doesn't mean you can't write a story that takes place in one. It just means you have to do your research, and it'll likely be a longer, harder process than it would be for someone with a lot of restaurant experience. But who cares? With research, you can fake a lot of stuff. It's not like Tolkien had been shot by an arrow, right? But, boy, he faked it. 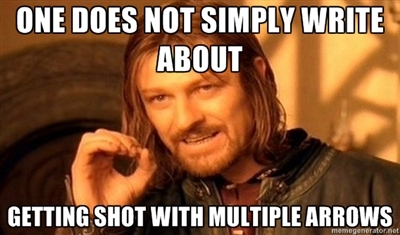 Poor Boromir. What you can't fake, though, is emotion. While that doesn't mean you have to stick to the exact type of loss that you know, it does mean that you can't cheat and use the breakup of your high school boyfriend to create the emotions of a husband of 20 years losing his wife to a long battle with cancer. No matter your occupation or personal history, or your setting or the age of your characters, write what you want to write. But when you're dealing with emotions, dig deep, and write what you know. Write what you feel. Do you have any advice about "writing what you know"...or a delicious cookie recipe? ;) Please, sound off in the comments below! Hmm...cookies, not so much. But I do have the world’s best recipes for both chocolate and vanilla frosting. As in, I don’t even really like frosting and I happily eat both of these recipes straight from the bowl. They are THAT good. I also know how to cook steak to perfection (though it is a smoky process) and how to make killer chicken fajitas. I think it’s also important, when thinking about writing what you know, to take into account the knowledge of those readily available to you. In my family I have my mom whose knowledge includes horse farms, being a flight attendant and also having traveled to many countries in that capacity. My brother is an architect, my sister-in-law is a master gardener and artist, my stepfather is an aerospace engineer for NASA (omigosh, talk about recognizing inconsistencies in movies- I remember him laughing his way through Armageddon), my stepmom is a credit card fraud investigator (and used to be an elementary school teacher), my dad is an expert on firearms, computers, airplanes (he was a pilot), airline procedures, cameras, and...a lot of other stuff! I’ve got a father-in-law whose job is too top secret for me to know much about it, my mother-in-law is a nurse, and I have another father-in-law who is a constable (cop). And my husband is the security systems and sports expert. Hahahaha! I love everything about this, Kasey! And you're right: our knowledge goes beyond us. We can borrow from the experiences of others with all the detail and emotion needed to make it believable, as long as we leave room for ourselves, right? P.S. You had me at frosting.